Louis van Gaal has won the league title in the Netherlands, Spain and Germany. Manchester United face "a reality check" this season but should stick with manager Louis van Gaal, says former defender Phil Neville. 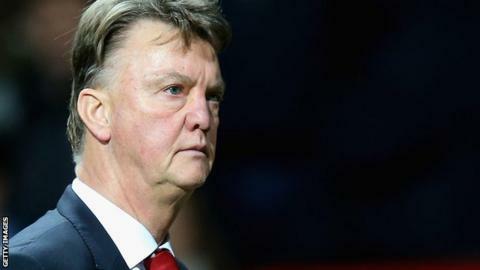 Van Gaal said he is "worried" about his job after defeat against Norwich made it six games without a win. "It's not the Sir Alex Ferguson era now; that time has gone and there needs to be a reality check," Neville told BBC Radio 5 live. "It's the Louis van Gaal era. Constant change is not the answer." Van Gaal has been criticised by some supporters for his side's style of play, and the Old Trafford defeat by Norwich meant United had gone six games in all competitions without victory for the first time since 1998. United had 70% possession against the Carrow Road club, but could only muster two shots on target as they were booed off by their own supporters. Ferguson won the last of his 13 league titles in 2013, with United finishing seventh and fourth in the two seasons since. They are currently in fifth place, nine points behind leaders Leicester City. But Neville - assistant to brother Gary at Spanish club Valencia - believes the Dutch manager should be judged at the end of the season. "I was at United as a player for nine years and it wasn't pretty every week," he said. "There seems to be an obsession at all clubs now, if you don't get the right results in four or five games then it's time to change the manager. That is not the answer. "There is talent in the team. United are only a few points off the top three, it's not all doom and gloom but performances must get better. "They need to put faith in a man who has won trophies in every major European country. United asked him to get into the Champions League, and he did, now this year is about winning a trophy. "He has the experience, he can handle being at Old Trafford and people need to relax about constantly needing to change and sack managers. "United have to make a decision. Do they turn into a club who changes manager every 12 to 18 months or do they look for stability?" Neville's former team-mate Ryan Giggs is currently assistant to Van Gaal and was noticeably more prominent in the technical area during the second half of the Norwich defeat. The Welshman is receiving an education in coaching under Van Gaal and will be a fine manager in the future, according to Neville. "I'm an assistant manager and if I'm losing at home then I go into the technical area and try and change things, that's what Ryan Giggs was doing on Saturday," Neville said. "He was trying to get a reaction from the crowd. Ryan is working for a great manager and learning lots. He will be a brilliant manager in the years to come."